While the world of the international sanitary, heating and air-conditioning industry meets in Frankfurt, the German sanitary manufacturers of the Blue Responsibility initiative draw attention to the sustainable solutions with which the modern bathroom of tomorrow can be designed, e.g. with networkable fittings or with intelligent room concepts that elegantly hide the functions of the bathroom. As the world's leading trade fair for plumbing, heating and air-conditioning, ISH is regarded as the industry's most important meeting place where pioneering innovations are presented. Sustainable sanitation solutions are not only very popular in Germany. "Building technology made in Germany has become an export hit," says Dirk Gellisch of Viega. "Another sign of this is the visitor structure at ISH: this year more than 40 percent of visitors will come from other countries around the globe. Demand for the products of German brand manufacturers is at a constantly high level worldwide. "However, the processing capacities in the craft sector are not yet sufficient to fully meet demand," Andreas Dornbracht of Dornbracht points out. Gellisch sees a fundamental challenge in the lack of skilled workers: "The gap between possible orders - for example in bathroom renovation to install barrier-free showers - and qualified skilled tradesmen for the execution is continuously widening. This is a clear obstacle to growth that is likely to continue for some time to come." German brand manufacturers are thus developing ever more efficient solutions for the construction process. "We develop intelligent products and systems that make work on the construction site faster, more economical and safer. As a manufacturer, we can thus make a measurable contribution to cushioning the shortage of skilled workers on site," emphasizes Gellisch. The worldwide megatrend of digitization is reflected in the sanitary industry and in the entire technical building equipment. German brand manufacturers are driving this development forward both in front of and behind the wall. "Our current challenge is to get our specialist partners enthusiastic about our connectible valves. Smart Home has long been an important topic in the field of drinking water hygiene," says Marcel Wirtz of Syr. With smart systems, drinking water installations can be even better protected, controlled and optimised. The Internet of Things, in which devices and machines are intelligently networked with each other, is also driving product development in front of the wall. "In principle, however, we always focus on people and their needs when developing technical solutions. Our credo is to create real added value, offer our customers more comfort and help them increase their health and life energy," says Dornbracht. Practical and convenient solutions for urban living space are also becoming increasingly important, e.g. 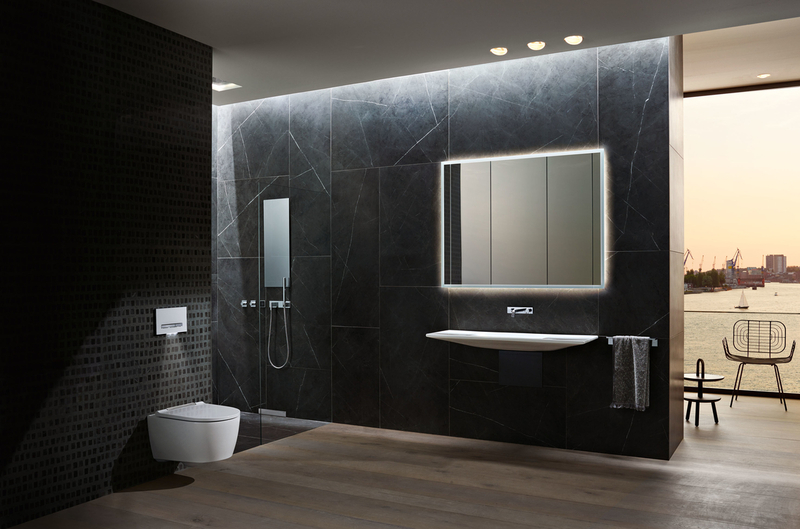 for small bathrooms: "In cities, living space is becoming ever scarcer and more expensive, and the requirements for sanitary room design are correspondingly more demanding," says Volker Röttger of Geberit. That's why manufacturers are developing sustainable concepts that convince with simple elegance and plenty of storage space. "Functions that are visually and operationally disruptive - such as siphons, brackets and fasteners - are increasingly moving out of view. The bathroom not only looks tidier, but also cleaner and offers even more space," explains Röttger. The trend is towards minimalist fitting elements on the wall, which ensure less installation work and less maintenance, such as those from Keuco. Open living is also on the rise, so that the boundary between bathroom and living area is further blurred. German bathroom furniture specialists such as Burgbad integrate water-bearing systems invisibly and elegantly into living areas. With their innovative products, the brand manufacturers of the Blue Responsibility sustainability initiative are shaping the trends of tomorrow's sanitary industry. "German manufacturers are popular worldwide not only because of their innovations: their sanitary solutions are also convincing in terms of quality and sustainability, making them international pioneers," says Wolfgang Burchard, spokesman for Blue Responsibility.